· Ectopic impulse: Any impulse that does not originate from the sinus node is an ectopic impulse. The ectopic impulse may be supraventricular or ventricular in origin. o Supraventricular impulse: The impulse is supra ventricular if it originates from the atria or atrioventricular (AV) junction or anywhere above the bifurcation of the bundle of His (Fig. 13.1). Supraventricular impulses have narrow QRS complexes because they follow the normal AV conduction system and activate both ventricles synchronously. o Ventricular impulse: The impulse is ventricular if it originates in the ventricles or anywhere below the bifurcation of the bundle of His. The ventricular impulse has wide QRS complex because the impulse does not follow the normal AV conduction system. It activates the ventricles sequentially by spreading from one ventricle to the other by muscle cell to muscle cell conduction. Ventricular complexes will be further discussed in Chapter 21, Ventricular Arrhythmias. · Supraventricular complexes may be premature or they may be late. o Premature supraventricular complex: The supraventricular complex is premature if it occurs earlier than the next expected normal sinus impulse (Fig. 13.2A). The premature supraventricular impulse may originate from the atria or AV junction. Figure 13.1: Ectopic Impulses. Ectopic impulses may be supraventricular or ventricular in origin. Supraventricular impulses originate anywhere above the bifurcation of the bundle of His and could be atrial or atrioventricular junctional. Ventricular impulses originate from the ventricles or anywhere below the bifurcation of the bundle of His. The stars represent the origin of the ectopic impulses. § Premature atrial complex: An early impulse originating from the atria is called a premature atrial complex (PAC). § Premature junctional complex: An early impulse originating from the AV junction is called a premature junctional complex (PJC). o Late or escape supraventricular complex: The supraventricular impulse is late if it occurs later than the next expected normal sinus impulse (Fig. 13.2B). Similar to premature complexes, late complexes may originate from the atria or AV junction. Late impulses are also called escape complexes. Late or escape complexes were previously discussed in Chapter 12, Sinus Node Dysfunction. 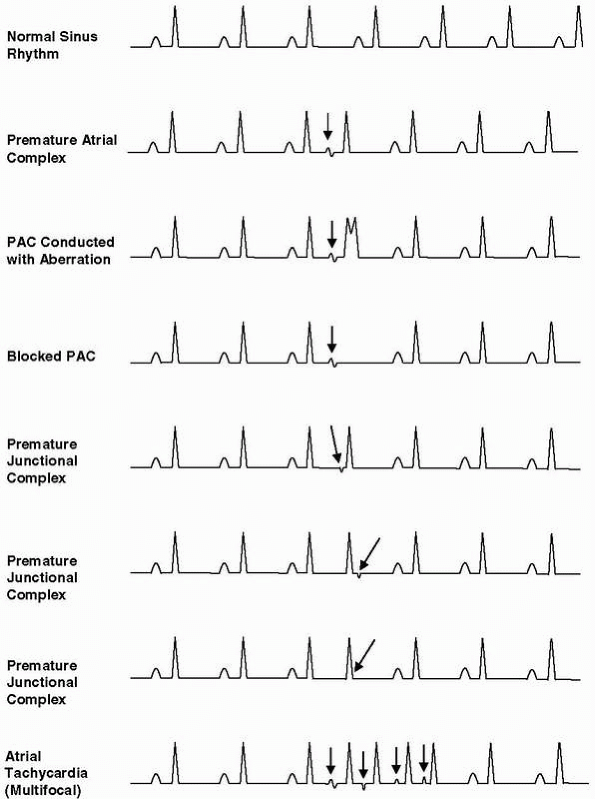 · Premature atrial complex: A PAC is easy to recognize because the impulse is premature and is followed by a pause. o Typical presentation: The typical presentation of a PAC is shown in Figure 13.2A. Because the PAC originates from the atria, the atria are always activated earlier than the ventricles; thus, the P wave always precedes the QRS complex. The P wave is not only premature, but also looks different in size and shape compared with a normal sinus P wave. The QRS complex is typically narrow similar to a normally conducted sinus impulse (Fig. 13.2A). Figure 13.2: Premature and Late Atrial Complexes. The diagram on the left shows an impulse originating from the atria (star). This ectopic impulse may be premature or late. A premature atrial impulse is shown in rhythm strip A. The atrial impulse occurs earlier than the next normal sinus impulse. The premature P wave is recognized as a notch superimposed on the down slope of the T wave of the previous complex (arrow). This premature impulse is followed by a narrow QRS complex. The lower rhythm strip B shows a late atrial complex (arrow). The atrial complex occurs later than the next expected sinus impulse with a P wave configuration that is different from the sinus P waves. This late impulse is also called an escape atrial complex. § Blocked or nonconducted PAC: The PAC may be completely blocked, meaning that the atrial impulse may not be conducted to the ventricles. § PAC conducted with prolonged PR interval: The PAC may be conducted to the ventricles with a prolonged PR interval. § PAC conducted with aberration: The PAC may be conducted to the ventricles with a wide QRS complex and mistaken for PVC. · Blocked PAC: A premature atrial impulse may not be conducted to the ventricles because of a refractory AV node or His-Purkinje system. This usually occurs when the PAC is too premature and the AV node or His-Purkinje system has not fully recovered from the previous impulse. This is seen as a premature P wave without a QRS complex (Fig. 13.3). The P wave may be difficult to recognize if it is hidden in the T wave of the previous complex or the P wave is flat or isoelectric and is not visible in the lead used for recording. Figure 13.3: Blocked PAC. The arrow points to a premature P wave without a QRS complex. This is an example of a blocked or nonconducted PAC. The premature P wave can not conduct across the AV node because the AV node is still refractory from the previous impulse. The premature P wave may not be apparent because it is hidden by the T wave of the previous complex, thus the pause following the PAC may be mistaken for sinus arrest or sinoatrial block. · PAC with prolonged PR interval: Instead of the premature P wave being completely blocked without a QRS complex, the atrial impulse may be delayed at the AV node resulting in a prolonged PR interval measuring >0.20 seconds (Fig. 13.4). · PAC conducted with aberration: The premature atrial impulse may be conducted normally across the AV node and bundle of His, but may find one of the bundle branches still refractory from the previous impulse. Thus, the PAC will be conducted across one bundle branch (but not the other branch that is still refractory), resulting in a wide QRS complex. PACs that are conducted with wide QRS complexes are aberrantly conducted PACs. Aberrantly conducted PACs usually have a right bundle branch block configuration because the right bundle branch has a longer refractory period than the left bundle branch in most individuals. Aberrantly conducted PACs are frequently mistaken for PVCs because they have wide QRS complexes (Fig. 13.5). Figure 13.4: Premature Atrial Complex (PAC) Conducted with a Prolonged PR Interval. The PAC marked by the arrow, is conducted with a prolonged PR interval (bracket). The P wave is premature and has a different configuration when compared to the normal sinus P waves. In spite of the prolonged PR interval, the impulse is conducted normally to the ventricles resulting in a narrow QRS complex. · PACs may also occur in bigeminy or in trigeminy (Figs. 13.6,13.7,13.8,13.9) or they may occur in pairs or couplets or in short bursts of atrial tachycardia. · Atrial tachycardia: The rhythm is atrial tachycardia if three or more PACs occur consecutively with a rate >100 beats per minute (bpm) (Fig. 13.10). o Multifocal atrial tachycardia: The tachycardia is multifocal if the P waves have different morphologies (Fig. 13.11). Figure 13.5: Premature Atrial Complex (PAC) Conducted with Aberration. The third QRS complex is premature and is wide and may be mistaken for a premature ventricular contraction (PVC). Note, however, that there is an ectopic P wave preceding the wide QRS complex (arrow), suggesting that the wide QRS complex is a PAC, not a PVC. This type of PAC with wide QRS complex is aberrantly conducted. Aberrantly conducted PACs usually have right bundle branch block configuration and the QRS complexes are triphasic with rsR' configuration in V1 as shown. o Multifocal atrial rhythm:Multifocal atrial rhythm is present if three or more consecutive PACS are present with a rate ≤100 bpm (Fig. 13.12). · A single PAC can precipitate a run of atrial tachycardia, atrial flutter, or atrial fibrillation when there is appropriate substrate for reentry (Fig. 13.13). · Compensatory pause: The pause after a PAC is usually not fully compensatory in contrast to the pause after a PVC, which is usually fully compensatory. A pause is fully compensatory if the distance between two sinus complexes straddling a PAC is the same as the distance between two sinus complexes straddling a normal sinus impulse. o PAC: The PAC does not have a fully compensatory pause because the PAC activates not only the atria, but also resets the sinus node by discharging it earlier than normal. Thus, the duration of two sinus cycles straddling a PAC is shorter than the duration of two similar sinus cycles straddling another sinus impulse (Fig. 13.14). o PVC: The pause after a PVC is usually fully compensatory because the PVC does not reset the sinus node (Fig. 13.15). Thus, the sinus node continues to discharge on time. However, if the PVC is retrogradely conducted to the atria, it might reset the sinus node and the pause may not be fully compensatory. · PACs are commonly mistaken for other arrhythmias. o Blocked PACs may be mistaken for sinus arrest or sinoatrial block: The pauses caused by blocked PACs may be mistaken for sinus node dysfunction and may result in an erroneous decision to insert a temporary pacemaker (Fig. 13.16A, B). Figure 13.6: Premature Atrial Complex (PAC) Occurring in Bigeminy. Every other complex is a PAC (arrows). Figure 13.7: Premature Atrial Complex (PAC) in Trigeminy. Every third complex is a PAC. The ectopic P waves are seen as small bumps deforming the T waves of the previous complexes (arrows). The PACs are conducted normally and the QRS complexes are narrow. Figure 13.8: Aberrantly Conducted Premature Atrial Complex (PAC) in Trigeminy. Every third complex is a PAC. The ectopic P waves are marked by the arrows and are followed by wide QRS complexes that are different from the sinus complexes. These PACs are aberrantly conducted. Figure 13.9: Normally Conducted, Aberrantly Conducted, and Blocked Premature Atrial Complex (PAC). The arrows point to the PACs. The first PAC is normally conducted. The PR interval is short and the QRS complex is narrow. The second PAC is conducted with aberration. An ectopic P wave is followed by a wide QRS complex. The third and fourth PACs are blocked and are followed by pauses. The blocked PACs can be identified by the presence of deformed T waves of the previous complexes. Note that the T waves of the QRS complexes during normal sinus rhythm are flat (right side of the tracing), whereas the T waves with blocked PACs are peaked and are followed by pauses. Figure 13.10: Atrial Tachycardia. Three or more consecutive premature atrial complexes in a row is considered atrial tachycardia if the rate exceeds 100 beats per minute. Figure 13.11: Multifocal Atrial Tachycardia. When three or more consecutive multifocal premature atrial complexes are present (arrows) with a rate >100 beats per minute, the rhythm is called multifocal atrial tachycardia. Figure 13.12: Multifocal Atrial Rhythm or Chaotic Atrial Rhythm. The rhythm shows P waves with varying sizes and shapes (arrows) similar to the arrhythmia shown in Figure 13.11. The rate, however, is ≤100 beats per minute and does not qualify as tachycardia. The arrhythmia is called multifocal atrial rhythm, chaotic atrial rhythm, or simply sinus rhythm with multifocal premature atrial complexes. Figure 13.13: Premature Atrial Complexes (PACs) Causing Atrial Fibrillation. A single PAC (arrow) can precipitate atrial tachycardia, atrial flutter, or atrial fibrillation when there is appropriate substrate for reentry. Figure 13.14: The Pause after a Premature Atrial Complex (PAC) is not Fully Compensatory. The rhythm strip shows a PAC followed by a pause that is not fully compensatory. The fourth P wave, marked by the star, is a PAC. DistanceA, which includes two sinus impulses straddling the PAC is shorter than distance B, which includes two sinus impulses straddling another sinus complex. ms, milliseconds. Figure 13.15: The Pause after a Premature Ventricular Contraction (PVC) is Usually Fully Compensatory. The rhythm strip shows frequent PVCs. The pause after each PVC is fully compensatory. Note that the distance between two sinus impulses straddling a PVC (distance A) is the same as the distance between two sinus impulses straddling another sinus impulse (distance B). ms, milliseconds. Figure 13.16: Blocked Premature Atrial Complexes (PACs) Resembling Sinus Pauses. Rhythm strips A and B are examples of blocked PACs (arrows). The premature P waves (arrows) are barely visible because they are superimposed on the T wave of the previous complex. What is striking when PACs are blocked is the appearance of sudden pauses. The pauses can be mistaken for sinus arrest or sinus pause. o Blocked PACs may also be mistaken for second-degree AV block: The blocked PACs look like sinus P waves that are not conducted and may be mistaken for second-degree AV block. This may also result in an erroneous decision to insert a pacemaker (Fig. 13.17). Aberrantly conducted PACs may be mistaken for PVCs: Aberrantly conducted PACs have wide QRS complexes that can be mistaken for PVCs (Fig. 13.18). · Blocked PACs in bigeminy mistaken for sinus bradycardia: In Fig. 13.19A, the rhythm starts as normal sinus with a rate of 74 bpm. The third complex is a PAC conducted aberrantly. This is followed by normal sinus rhythm with a normally conducted QRS complex and a succession of blocked PACs in bigeminy (arrows), which can be mistaken for sinus bradycardia. The 12-lead electrocardiogram (ECG) in Fig. 13.19B is from the same patient showing a slow rhythm with a rate of 44 bpm. The rhythm is slow not because of sinus bradycardia, but because of blocked PACs in bigeminy. The atrial rate, including the blocked PACs, is actually double and is 88 bpm. · The P wave is premature and is inscribed before the QRS complex. The P wave may be difficult to recognize if it is hidden in the T wave of the previous complex or is isoelectric in the lead used for monitoring. · The P wave is ectopic and therefore has a different contour when compared with the sinus impulse. · The PR interval may be normal (≥0.12 seconds) or it may be prolonged (>0.20 seconds). · The P wave may be blocked and not followed by a QRS complex; thus, only a pause may be present. Figure 13.17: Blocked Premature Atrial Complexes (PACs) Resembling Atrioventricular (AV) Block. The PACs are marked by the arrows. The first PAC is conducted to the ventricles. The second and third PACs are blocked. The nonconducted PACs may be mistaken for sinus P waves and the rhythm mistaken for second-degree AV block. · The QRS complex is narrow, similar to a normally conducted sinus impulse. · The QRS complex may be wide when the impulse is conducted to the ventricles aberrantly or there is preexistent bundle branch block. · A QRS complex may not be present if the PAC is blocked. · The pause after the PAC is usually not fully compensatory. · P wave: The PAC may originate anywhere in the atria including veins draining into the atria such as the coronary sinus, pulmonary veins, and vena cava. The impulse originates from cells that are capable of firing spontaneously. The ectopic P wave has a different contour compared with the normal sinus impulse and always precedes the QRS complex. Figure 13.18: Premature Atrial Complex (PAC) Conducted with Aberration. The first PAC (star) is conducted to the ventricles normally. The QRS complex is narrow, similar to a normally conducted sinus impulse. Another PAC is marked with an arrow. This PAC is conducted with aberration. The QRS complex after the P wave is wide and can be mistaken for premature ventricular contraction. · QRS complex: The impulse follows the normal AV conduction system, resulting in a narrow QRS complex similar to a normally conducted sinus impulse. The premature atrial impulse may be delayed or blocked on its way to the ventricles, depending on the prematurity of the PAC and state of refractoriness of the AV node and conducting system. o Blocked PAC: If the AV node or distal conduction system is still refractory (has not fully recovered) from the previous impulse, the PAC will activate only the atria, but will not be able to conduct to the ventricles resulting in a premature P wave without a QRS complex. o Aberrantly conducted: The PAC is followed by a wide QRS complex and can be mistaken for PVC. When the PAC is too premature, it may be able to conduct through the AV node, but finds either the right or left bundle branch still refractory from the previous impulse. If the right bundle branch is still refractory, the premature atrial impulse will reach the ventricles only through the left bundle branch instead of both bundle branches, resulting in a wide QRS complex. Figure 13.19: Blocked Premature Atrial Complexes (PACs) in Bigeminy Resembling Sinus Bradycardia. (A) The rhythm is normal sinus at 74 bpm (first two sinus complexes on the left). The first arrow shows a PAC that is conducted with aberration. 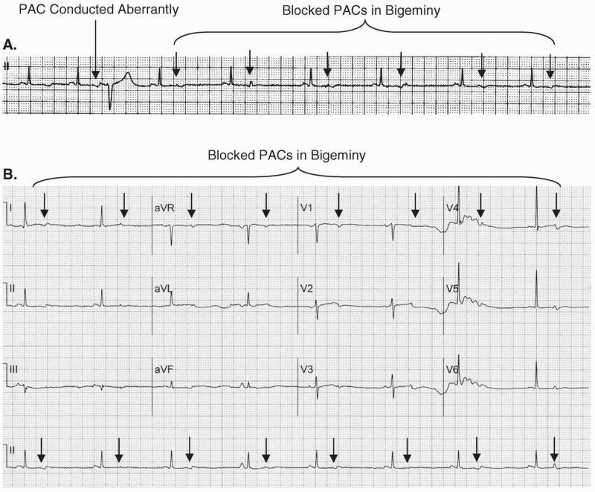 The subsequent PACs are blocked PACs occurring in bigeminy (arrows). (B) Twelve-lead electrocardiogram obtained from the same patient showing blocked PACs (arrows) in bigeminy. The slow heart rate can be mistaken for sinus bradycardia. · Compensatory pause: The PAC activates not only the atria but also resets the sinus node by discharging it prematurely. Thus, the pause after a PAC is not fully compensatory. Occasionally, however, the sinus node may be suppressed by the PAC preventing it from recovering immediately. This may result in a pause that is fully compensatory, similar to a PVC, or the pause may even be longer than a full compensatory pause. · PACs frequently occur in normal individuals as well as those with structural heart disease. These extra heartbeats may cause symptoms of palpitations. Most PACs, however, do not cause symptoms and most individuals are not aware that they have premature atrial impulses. They may be detected during routine ECG, which may be taken for reasons other than palpitations. · PACs, especially when frequent, may be caused by excessive coffee or tea, smoking, diet pills, thyroid hormones, digitalis, antiarrhythmic agents, isoproterenol, theophylline, and albuterol. They can also occur in the presence of electrolyte abnormalities, congestive heart failure, coronary disease, valvular heart disease (especially mitral valve prolapse), cardiomyopathy and other noncardiac conditions such as pulmonary diseases, infections, thyroid disorders, and other metabolic abnormalities. · PACs may be mistaken for PVCs when they are aberrantly conducted or sinus pauses when they are nonconducted. Blocked PACs is the most common cause of sudden lengthening of the P-P or R-R interval and should always be suspected before sinus node dysfunction is considered. · Although single or repetitive PACs are benign, they may trigger sustained arrhythmias (atrial tachycardia, atrial flutter, or atrial fibrillation) when there is appropriate substrate for reentry. Similar to the ventricles, the atria have a vulnerable period in which a premature atrial impulse can precipitate atrial fibrillation. This often occurs when the PAC is very premature with coupling interval that is <50% of the basic P-P interval (P to PAC interval is <50% of the basic rhythm). Thus, overall treatment of atrial tachycardia, flutter, or fibrillation may include suppression or elimination of ectopic atrial impulses. · Ectopic atrial impulses generally do not cause symptoms. If the patient is symptomatic and the palpitations have been identified as resulting from PACs, treatment usually involves correction of any underlying abnormality, electrolyte disorder, or any precipitating cause that can be identified such as exposure to nicotine, caffeine, or any pharmacologic agent that can cause the arrhythmia. Treatment also includes reassurance that the arrhythmia is benign. Pharmacologic therapy is not necessary. When reassurance is not enough, especially if the patient is symptomatic, beta blockers may be tried and if contraindicated because of reactive airway disease, nondihydropyridine calcium channel blockers (diltiazem or verapamil) may be used as alternative. · Single or repetitive atrial complexes are benign in patients without cardiac disease. In patients with known cardiac disease, the prognosis depends on the nature of the cardiac abnormality and not the presence of atrial ectopy. · Atrioventricular junction: The AV junction includes the AV node down to the bifurcation of the bundle of His. It is the center of the heart because it is located midway between the atria and ventricles. · Atrioventricular node: The AV node can be divided into three distinct areas with different electrophysiologic properties. These include the upper, middle, and lower AV node (Fig. 13.20). o Upper AV node: The upper portion or head of the AV node is directly contiguous to the atria. This portion is called AN, or atrionodal region. It receives impulses from the atria and relays it to the rest of the conduction system. This area of the AV node contains cells that are capable of firing spontaneously. o Middle AV node: The middle portion of the AV node is also called the N (nodal) region. This is the body or AV node proper. This portion of the AV node contains cells that conduct slowly and is responsible for the delay in the spread of the atrial impulse to the ventricles. This portion of the AV node does not contain cells that are capable of firing spontaneously and therefore can not initiate an ectopic impulse. o Lower AV node: The tail or lower portion of the AV node is directly contiguous with the bundle of His and is called NH or nodo-His region. This portion of the AV node contains cells with pacemaking properties and is usually the site of origin of the junctional impulse. · The AV junction is the only pathway by which the sinus impulse is conducted to the ventricles. The AV junction is also the origin of the junctional impulse. · Any impulse originating from the AV node or bundle of His is a junctional impulse. Figure 13.20: Diagrammatic Representation of the Atrioventricular (AV) Junction. The AV junction includes the AV node down to the bifurcation of the bundle of His. The AV node consists of the upper (AN region), mid- or AV node proper (N region), and lower AV node (nodo-His) region. Figure 13.21: Premature Junctional Complex (PJC). The different patterns of PJC are shown. (A) Retrograde P wave is inscribed before the QRS complex. (B) Retrograde P wave is inscribed after the QRS complex. (C) Retrograde P wave is synchronous with the QRS complex or the impulse is blocked on its way to the atria, but is normally conducted to the ventricles. o Atrial activation: An impulse originating from the AV junction will activate the atria retrogradely from below upward because the AV junction is located below the atria. This causes the P wave to be inverted in leads II, III, and aVF. Both left and right atria are activated synchronously, causing the P wave to be narrow. Ventricular activation:Because the AV junction is located above the ventricles, an impulse originating from the AV junction will activate the ventricles anterogradely through the normal AV conduction system, resulting in narrow QRS complexes similar to a normally conducted sinus impulse. · ECG findings: A PJC can manifest in several different patterns, depending on the speed of conduction of the junctional impulse to the atria and to the ventricles. Thus, the retrograde P wave may occur before or after the QRS complex or it may occur synchronously with the QRS complex. o Retrograde P wave before the QRS complex: Retrograde P wave occurring in front of the QRS complex suggests that the speed of conduction of the junctional impulse to the atria is faster than the speed of conduction of the impulse to the ventricles (Fig. 13.21A). 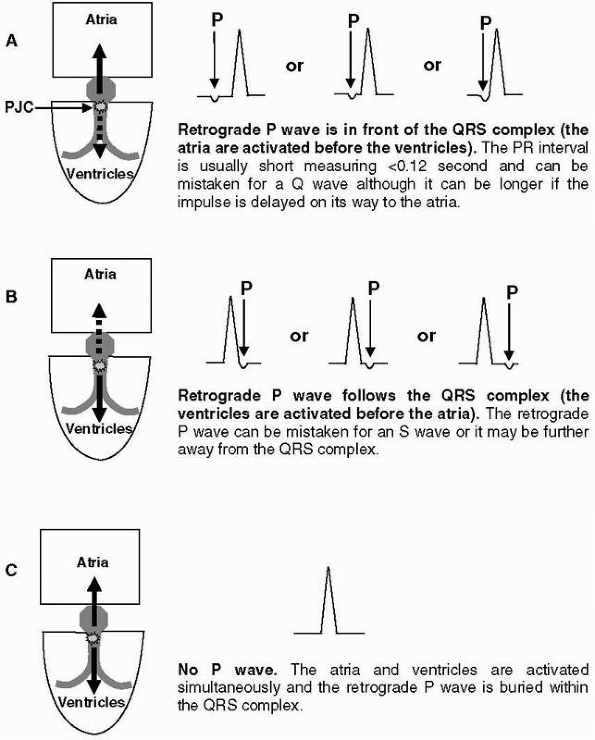 o Retrograde P wave after the QRS complex: Retrograde P wave occurring after the QRS complex suggests that the speed of conduction of the junctional impulse to the ventricles is faster than the speed of conduction of the impulse to the atria (Fig. 13.21B). o Retrograde P wave synchronous with the QRS complex:When there is simultaneous activation of the atria and ventricles, the retrograde P wave will be superimposed on the QRS complex and will not be visible. Only a QRS complex will be recorded (Fig. 13.21C). The retrograde P wave may also be absent if the junctional impulse is blocked at the AV node on its way to the atria but is conducted normally to the ventricles. · Figure 13.21 shows the different patterns of premature junctional impulse when recorded in lead II. · Examples of single premature junctional complexes are shown (Figs. 13.22,13.23,13.24). When P waves are present, the P waves are always retrograde and are inverted in leads II, III, and aVF and can occur before or after the QRS complex. Figure 13.22: Premature Junctional Complex (PJC) with a P Wave Before the QRS Complex. Lead II rhythm strip showing a PJC. When an ectopic P wave precedes the QRS complex, a PJC may be difficult to differentiate from a prema ture atrial complex (PAC). In PJC, the P wave is always retrograde and inverted in leads II, III, and aVF, which is not always the case if the ectopic impulse is a PAC. The PR interval is usually short measuring <0.12 seconds, although it could be longer if the retrograde impulse is delayed at the atrioventricular (AV) node. The retrograde P wave is narrow because the AV node is located inferiorly, midway between the atria, thus both atria are activated retrogradely simultaneously. An atrial impulse is wider, especial ly if it originates from the lateral border of either atrium because the impulse has to activate the atria sequentially instead of simultaneously. · Accelerated junctional rhythm: The AV junction has an intrinsic rate of approximately 40 to 60 bpm. If the rate is 61 to 100 bpm, accelerated junctional rhythm is the preferred terminology (Figs. 13.25,13.26,13.27,13.28). This rhythm is also traditionally accepted as junctional tachycardia even if the rate is ≤100 bpm because junctional rhythm with a rate that is >60 bpm is well above the intrinsic rate of the AV junction. This is further discussed in Chapter 17, Supraventricular Tachycardia due to Altered Automaticity. · A summary of the different supraventricular complexes is shown diagrammatically in Figure 13.29. Figure 13.23: Premature Junctional Complex (PJC) with a P Wave After the QRS Complex. Lead II rhythm strip showing a PJC (fourth complex). The premature impulse starts with a QRS complex followed by a retrograde P wave (arrow). · When P waves are present, they are always retrograde and are inverted in leads II, III, and aVF. · The retrograde P wave may occur before the QRS complex. · The retrograde P wave may occur after the QRS complex. · The P wave may be entirely absent; thus, only a premature QRS complex is present. · The QRS complex is wide if there is pre-existent bundle branch block or the impulse is aberrantly conducted. · A unique and unusual presentation of PJC is absence of P wave or QRS complex and is thus concealed. · The AV junction includes the AV node and bundle of His. The AV node consists of three areas with different electrophysiologic properties: the AN (atrionodal), N (nodal), and NH (nodo-His) regions corresponding to the top, middle, and caudal portions, respectively. A premature junctional impulse may originate anywhere in the AV junction except the middle portion of the AV node because this portion of the AV node does not contain cells with pacemaking properties. Junctional impulses usually originate from the NH region. · Because the AV junction lies midway between the atria and ventricles, the atria are activated retrogradely from below upward in the direction of -60° to -150°. Thus the P waves are inverted in leads II, III, and aVF and are upright in leads aVR and aVL. The ventricles are activated anterogradely through the bundle of His and normal intraventricular conduction system. The QRS complexes are narrow, similar to a normally conducted sinus impulse, but may be wide if there is preexistent bundle branch block or if the impulse is conducted aberrantly. Figure 13.24: Premature Junctional Complex (PJC) Without a P Wave. Lead II rhythm strip showing PJC without a retrograde P wave. The P wave is buried within the QRS complex or the junctional impulse may have been blocked retro gradely on its way to the atria. It is also possible that an ectopic P wave is present but the axis of the P wave is isoelectric in this lead used for recording. Figure 13.25: Accelerated Junctional Rhythm With P Waves Before the QRS Complexes. Lead II rhythm strip showing accelerated junctional rhythm with retrograde P waves preceding the QRS complexes (arrows)with very short PR intervals. The retrograde P waves can be mistaken for Q waves. Although the rate is <100 bpm, the rhythm is traditionally accepted as junctional tachycardia because it exceeds its intrinsic rate of 40 to 60 bpm. Figure 13.26: Accelerated Junctional Rhythm With P Waves After the QRS Complexes. Lead II rhythm strip showing accelerated junctional rhythm with retrograde P waves immediately after the QRS complexes (arrows). The retrograde P wave can be mistaken for S waves. Note that the P waves are narrow. Figure 13.27: Accelerated Junctional Rhythm Without P Waves. Retrograde P waves are not present. Figure 13.28: Junctional Rhythm with Complete Atrioventricular (AV) Dissociation. The rhythm is accelerated junctional rhythm, also called junctional tachycardia (rate 80 beats per minute) with complete AV dissociation. Note that the QRS complexes are regular and are completely dissociated from the P waves (arrows). The P waves are regular and are normal sinus in origin (P waves are upright in lead II). Figure 13.29: Premature Supraventricular Complexes. Diagram shows the different types of supraventricular impulses. Arrows point to the ectopic supraventricular complexes. · The retrograde P wave is usually narrow because both atria are activated simultaneously. The P wave may occur before, after, or within the QRS complex. The position of the P wave in relation the QRS complex depends on the speed of conduction of the junctional impulse retrogradely to the atria and anterogradely to the ventricles and not from the area of origin of the impulse within the AV junction. There are other possible ECG presentations of junctional rhythm. These include the following. o Complete AV dissociation: When there is junctional rhythm, the junctional impulse may control the ventricles, but not the atria. Thus, the P wave and the QRS complex may be completely dissociated. When this occurs, the atria are independently controlled by normal sinus rhythm or by atrial fibrillation. The ventricles are independently controlled by the junctional impulse. o Concealed junctional impulses—no P wave, no QRS complex: It is possible that the junctional impulse is blocked retrogradely on its way to the atria and anterogradely on its way to the ventricles; thus, no P wave or QRS complex will be recorded. When this occurs, the PJC is concealed or is nonconducted. The presence of a nonconducted junctional impulse is not visible in the ECG, but its presence can be inferred because it will affect the next sinus impulse by rendering the AV node refractory. This may result in varying degrees of pseudo-AV block. Thus, sudden and unexpected lengthening of the PR interval or intermittent second-degree AV block may be the only abnormality indicating the presence of concealed junctional ectopic impulses. · PJCs are much less common than PACs. Similar to PACs, they can occur in normal individuals as well as those with structural heart disease. Unlike PAC, in which the P wave always precedes the QRS complex, single or repetitive PJCs have varying ECG presentations. · When the retrograde P wave is in front of the QRS complex, a PJC may look like a PAC. The following findings suggest that the ectopic impulse is AV junctional rather than atrial. o AV junctional impulses always conduct to the atria retrogradely, thus the P waves are always inverted in leads II, III, and aVF. On the other hand, PACs may originate anywhere in the atria and may or may not be inverted in these leads. o Junctional P waves are usually narrow because the AV node lies in the lower mid-atria; thus, both atria are activated simultaneously. o The PR interval is usually short measuring <0.12 seconds. The PR interval however may be longer if the junctional impulse is delayed on its way to the atria. · Accelerated junctional rhythm is the preferred terminology if the rate exceeds 60 bpm. This rhythm is also accepted as nonparoxysmal junctional tachycardia because it is above the intrinsic rate of the AV junction, which is 40 to 60 bpm. Although the tachycardia may be seen in perfectly normal hearts, it is more commonly associated with inferior myocardial infarction, rheumatic carditis, cardiac surgery, and digitalis toxicity—especially when there is associated hypokalemia. Digitalis toxicity should be strongly considered when there is atrial fibrillation with regularization of the R-R interval in a patient who is taking digitalis. The arrhythmia may also be an escape mechanism when there is primary sinus node dysfunction or when there is hyperkalemia. Thus, the significance and treatment of nonparoxysmal junctional tachycardia depends on the underlying condition, which may be cardiac or noncardiac (see Nonparoxysmal Junctional Tachycardia in Chapter 17, Supraventricular Tachycardia due to Altered Automaticity). · Retrograde P waves occurring within or after the QRS complex may cause cannon A waves in the neck because of simultaneous contraction of both atria and ventricles. Patients therefore may complain of recurrent neck vein pulsations rather than palpitations. · The clinical significance and treatment of single or repetitive but nonsustained PJCs is the same as for PACs. · The prognosis of single and repetitive but nonsustained PJCs is benign because these ectopic complexes are present in structurally normal hearts. · Junctional ectopic rhythms, including accelerated junctional rhythm, may be a sign of sinus node dysfunction or presence of underlying heart disease or digitalis toxicity. The treatment and prognosis of this rhythm depends on the underlying cardiac condition. Marriott HJL. Atrial arrhythmias. In: Practical Electrocardiography. 5th ed. Baltimore: The William & Wilkins Co; 1972: 128-152. Wilkinson Jr DV. Supraventricular (atrial and junctional) premature complexes. In: Horowitz LN, ed. Current Management of Arrhythmias. Philadelphia: BC Decker Inc; 1991;47-50.